Doctors are missing key information they need to make decisions for cancer patients because some drug companies are not publishing clinical trials. 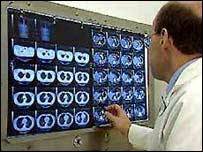 Scientists said about a quarter of cancer trials do not reach the public domain years after they are completed. Experts from Cancer Research UK, a charity, called for a comprehensive database in order to monitor research. They were speaking at the British Association's annual Festival of Science, meeting this week in Exeter. Dr Richard Sullivan, head of clinical programmes at Cancer Research UK, said if work remained unpublished it could slow down trials by other research groups and also lead to work being duplicated. "The medical community needs to know the results of clinical trials to be able to view the entire picture of how a treatment works, how it compares to other therapies and what choices could serve patients best," he said. "In academia, most preliminary trials end up being published. For confidential business information reasons and strategic reasons many preliminary trials do not see the light of day. "We are calling on industry to make a commitment to publishing these in the long term." A study in 2003 looking at 500 cancer clinical trials found that 26% failed to be fully published five years after preliminary data was first presented at a leading cancer conference. "All scientists, whether clinical or not, have a responsibility to make sure their data is accessible to the wider community," said Professor Fran Balkwill, head of translational oncology at the Cancer Research UK clinical centre in London. An additional problem arose from scientists publishing positive results and not negative ones for particular cancer drugs. "If only positive results are published this can distort medical literature and leave doctors thinking a treatment is more effective than it actually is," he explained. "This in turn can affect the validity and findings of subsequent reviews, treatment decisions and clinical practice guidelines." Dr Sullivan added that many drug companies were not registering their clinical trials in the first place. "We want to see a situation in five years' time when all clinical trials in cancer research or any other area are registered," said Dr Sullivan. He explained that 95-98% of all academic clinical trials are registered when they are opened up. Dr Sullivan welcomed the move by some companies such as GlaxoSmithKline to register all their clinical trials.